Model PSM03 mechanical pressure switches in a diaphragm or piston variant open or close a circuit, depending on whether the pressure is dropping or rising. An adjustment knob enables easy, convenient and continuous setting of the required switch point. 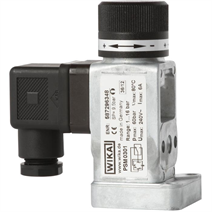 Optionally, WIKA offers its customers the factory setting of the switch point. Model PSM03 mechanical pressure switches are employed wherever compressed air, neutral and self-lubricating fluids or neutral gases are used and customers, due to their spatial conditions, have special requirements regarding the installation of the pressure switch. The high reproducibility of ±2 % of the switch point and the setting via the adjustment knob is interesting for customers for whom precision plays an important part. In addition, the individual orientation of the pressure switch makes the model PSM03 attractive for customers who set value on the adaptation of the switch to their specific space conditions.